Johnny Fuller was born in Dallas, Texas in 1975. He began studying piano at the age of seven and worked primarily under the careful instruction of Dr. Thelma Franklin Merrick. His collegiate studies in piano performance took place with Sue Mitz. He studied under such illustrious conductors as Dr. Stephen Holcomb, Dr. David Keith, Anshel Brusilow, Dr. Paul Phillips and Donald Neuen. Johnny played percussion at First Baptist Church of Dallas from 1990 to 1998 and served as their Orchestra Intern from 1996 to 1998. He served 17 years at Park Cities Baptist Church as Percussionist, Orchestral Arranger and Student Conductor (1998-2003), Orchestra Conductor (2003-2006) and Associate Minister of Music (2006-2015). He served as Orchestra Conductor at First Baptist Church of Garland from 2006 to 2015. He currently holds the position of Lead Director of Worship at Asbury United Methodist Church in Tulsa, OK.
Johnny's conducting style has been described as "graceful, yet powerful" (Sydney Opera House, 2012). He has served as a conducting clinician in Brazil and Russia. His article, “When You Don’t Have A Clarinet?,” was published in The Chorister in August of 2001. Locally, Johnny has worked with the Lone Star Youth Orchestra, the Dallas Asian American Youth Orchestra and the Allen Philharmonic Orchestra and has conducted classical performances at the Murchison Performing Arts Center, the Charles W. Eisemann Center and the Morton H. Meyerson Symphony Center. He has taken the New Life Symphony Orchestra to the concert hall of Beloselsky-Belozersky Palace in St. Petersburg, Tchaikovsky Concert Hall in Moscow, the Glasgow Royal Concert Hall, Usher Hall in Edinburgh, Sala Hall in São Paulo and the world-renowned Sydney Opera House, using symphonic repertoire as a magnet for drawing massive audiences to hear the Gospel. Their presentation at Tchaikovsky Concert Hall was televised on the Culture channel in every city across Russia. Johnny earned a Bachelor of Church Music with a concentration in theory and composition from Dallas Baptist University in 1999, where he received a Music Honor Award and Music Recognition Award. 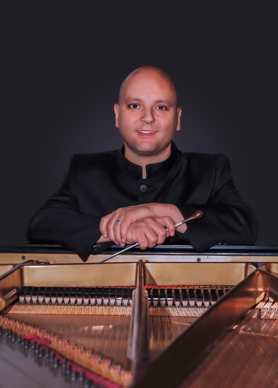 He completed a Masters in Orchestral Conducting from University of North Texas in 2006. Johnny and his wife, Heather, a cellist, have three daughters, Hannah, Ally (who went to be with our Lord on her eight-month birthday) and Selah, and two sons, Isaac and Andrew. The Fullers reside in Tulsa, OK.